Work in this industry can be hands on. In a professional world currently in a state of flux, IT workers play a crucial role in helping organisations supersede challenges. You may not believe it, but IT workers are the 3 most active profession behind accountants. It’s a tough gig – from meeting dynamic business requirements, to making the case for new technologies to the board and maximising return on IT investment. Work in this industry can be hands on. In a professional world currently in a state of flux, IT workers play a crucial role in helping organisations supersede challenges. Organisations are complex machines, and while there are many factors at play affecting a business’s ability to succeed despite uncertainty, complexity and disruption– such as robust yet agile business operations, resilient IT infrastructure, supportive stakeholders and strong leadership - staff well-being is one element that is often overlooked, dropping down the priority list in favour of other considerations. For example, this year a report by the Chartered Institute of Personnel and Development warned that only a minority of organisations have taken steps to challenge unhealthy working practices, despite the implications this could have for employees’ mental health. Forward-looking organisations know that resilience at all levels within an organisation is the key to sustainable competitive advantage. In the face of today's disasters, whether natural or man-made, the resilience of the whole organisation is as much dependent on the resilience of the constituent parts as it is on the creativity and innovation of the leadership. However, resilience building strategies rarely extend beyond departmental constructs to the most basic building block of an organisation – its people. For example, when thinking about IT resilience the strategy should go beyond ensuring a robust and agile infrastructure, implementing disaster recovery for both business as usual and contingency operations and both physical and logical security and extend to the people. Resilience depends on the lifeblood of your organisation – your employees – remaining happy and healthy. Having an engaged workforce, who can exhibit both physical and psychological resilience, is akin to taking to the track for a relay race knowing you’re passing the baton to someone who is not only physically fit but is psychologically prepared to give it their all. The concept that a program of regular mental activities can help maintain or improve one's cognitive abilities in much the same way that physical fitness is improved by exercising the body is a concept that is now not only espoused by self-help books but also gaining traction within mainstream academia. However, in much the same way we need motivation to attend the gym we also need motivation to train our brains. The sheer pace of technological development and the pressing need for its adoption can be daunting for organisations and appear like an insurmountable learning challenge for employees. However, making sure everyone keeps up to speed is essential for those wishing the future-proof their business. Successful organisations are keeping employees stimulated and motivated with regular bursts of high intensity training and demonstrating that they value them by equipping them with digital life skills – not simply equipping them with the tools to do their job. 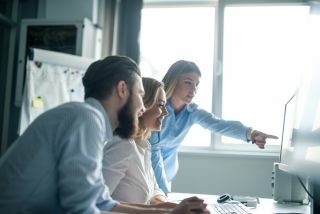 Investing in your workforce’s digital skills by implementing a training strategy gives employees confidence they can not only do their jobs both now and in the future but also helps them in their lives outside work. Unfortunately this type of training is not as widely available as it should be. For example, our recent research reveals both IT decision makers (31 per cent), and line of business decision makers (41 per cent) labelled skills as the biggest issue impacting digital initiatives. Technological change is both an opportunity and a challenge and organisations need to be aware that, regardless of the amount of digital training and awareness they implement some employees will always feel their role is threatened by new technologies – or even draw a blank as to where they can add value in the digitised workplace. Taking the time to speak to your employees to understand and address their concerns, can help secure their buy in and ensure they are motivated enough to drive projects to success. An open communication stream between key decision makers in your organisation and employees is a way of combatting digital anxiety and stresses that might be preventing your employees from embracing new technology and performing at their best. However, our recent research reveals that only 32 per cent of employees are kept up to date with the business’s digital roadmap - which means that many businesses are potentially alienating their employees and putting their digital transformation strategies at risk. Earlier this year it was estimated that 40 per cent of us spend just 15 minutes outdoors each day (excluding their commute to work), while a study by the Chartered Institute of Personnel and Development found that for the first time, stress is the major cause of long-term absence in manual and non-manual workers. Office jobs are sedentary and often involve being tucked away behind a computer screen – but that doesn’t mean businesses should not take an interest in activity beyond the office walls. Physical activity is crucial for improving our overall energy levels and strength, and while we mainly associate regular exercise with physical fitness, it can have a positive impact on mood and productivity. It not only makes economic sense – but means that employees are in the right headspace whatever challenges are thrown at them. Initiatives such as the IT Games Club help to support and inspire health and fitness in the IT industry. With the active participation of organisations globally including Hays Specialist Recruitment and the Grand Canyon University in North America, this focuses on improving mental wellbeing and encourages employees to share their positive sporting experiences in the workplace. Getting your staff active is one way to drive their careers – and ultimately, your organisation – to success. Business resilience is the ability to mitigate the impact of risks and move forward with confidence as your business transforms in the face of disruption. Ultimately, it’s about adapting in the face of unprecedented change. Through a combination of training, open communication and the encouragement of physical activity, you can ensure your employees are equipped for any challenges on the horizon – meaning your organisation remains in peak condition.